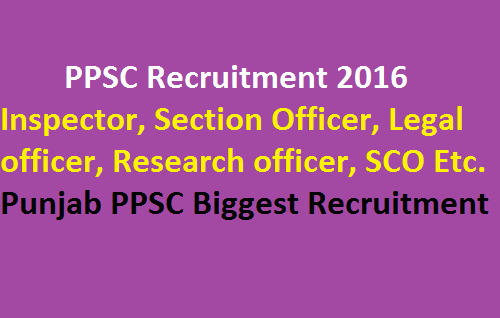 PPSC Recruitment 2016. Section officer, Inspector, Legal assistant, Reseasrch officer, SCO, DSWO Posts available to fill online and apply at www.ppsc.gov.in. The Punjab public service commission has finally released notification for recruitment under Punjab civil services examinations. total number of 363 + 6 posts of various different exams is now open to fill online application forms which has been started from 29th July 2016 and will last till 22nd August 2016. PPSC announced 300 inspector recruitment 2016 of which applications are on going. PPSC Section officer recruitment of 57 posts available to fill online. after the job alert of punjab police constable recruitment 2016.
now Punjab government is firing out with vacancies. there are total of 369 post vacancies available to apply by 12th august and 22nd Aug 2016 respectively. Research officer, legal assistant, inspector, soil conservation officer (sco), section officer (so) and district sainik welfare officer (dswo) available. most of candidates are wondering where to find eligibility criteria, Age limit, educational qualification, syllabus etc. so all these questions is going to answer below. Apply fast for PPSC Recruitment 2016 -17. Candidates Who All wish to Apply for punjab public service commission (ppsc) Are Requested to Download the Application Form From Below and Check Eligibility criteria, Age limit and other Basic Educational Qualification Required. Other Government Jobs All Around the India, Punjab Police jobs, Punjab Police Recruitment state wise for Constable, ASI, Sub Inspector or Inspector. Here We Provide Basic News on Recruitment and Examinations. Civil Services Examination Details and Other Main Factors. Org. Department Name: Punjab Public Service Commission (ppsc). Official Website of the Org: ppsc.gov.in. No. of Vacancies of Police Recruitment: 363 + 6 Vacancies. Job Category: State Punjab Government Job. Examination required: Yes, Written Test of 300 Marks + 40 Marks Interview. Type of Examination: competitive exam based on qualification. Name of the posts: Section officer, inspector, Research officer etc. Job location: Various Districts of Punjab. Start Date of Filling up the Forms: 29th July 2016. Last Date to Apply for Recruitment: 22nd August 2016. The Punjab Public Service commission organised recruitment notification for the post of of Inspector on 27.07.2016 and last date to fill up application forms is 22.08.2016. those who are elegible can check details below and apply as soon as possible. 3. Wards of Freedom Fighter,Punjab. 3 Vacancies. 4. Sports Person,Punjab. 5 Vacancies. 6. SC Others ,Punjab. 35 Vacancies. 7. SC ESM/LDESM,Punjab. 6 Vacancies. 8. SC Sports Person,Punjab 2 Vacancies. 9. Balmiki/Mazhbi Sikh Punjab. 35 Vacancies. 10. Balmiki/Mazhbi ESM/LDESM,Punjab 6 Vacancies. 11. Balmiki/Mazbhi Sikhs(Sports Persons),Punjab 1 Vacancies. 13. BC ESM/LDESM,Punjab. 7 Vacancies. PAY SCALE: Rs. 10300-34800 + 4200/- Grade Pay. ii) Passed a Computer course of at least one hundred and twenty hours with hands on experience in the use of Personal Computer. PPSC Recruitment 2016-17 Inspector, Section officer, Legal Assistant Etc. RECRUITMENT TO ONE POST OF LEGAL ASSISTANT IN THE DEPARTMENT OF LABOUR, GOVERNMENT OF PUNJAB. RECRUITMENT TO ONE POST OF RESEARCH OFFICER IN THE DEPARTMENT OF PLANNING, GOVERNMENT OF PUNJAB. RECRUITMENT TO 57 POSTS OF SECTION OFFICER IN THE DEPARTMENT OF FINANCE (TREASURIES AND ACCOUNTS) GOVT. OF PUNJAB. The Punjab Public Service Commission invites Online Application Forms from eligible candidates for recruitment to 57 Posts of Section Officer in department of finance (treasure and Accounts) Govt. of Punjab. PPSC SO Section officer recruitment eligibility, Age limit and other details are specified below. 3. Freedom Fighter, Pb 01. 4. Sports Person, Pb 03. 6. S.C. Others, Punjab 11. 7. S.C. ESM, Pb 03. 8. S.C. Sports Person, Pb 01. 9. Balmiki/Mazhbi Sikh, Punjab 13. 10. ESM, Balmiki/Mazhbi Sikh, Punjab 02. 11. Backward Classes, Pb 05. 12. B.C. ESM, Pb 02. PAY SCALE: Rs. 10300-34800 + 5000/- Grade Pay. Candidates should not be below 18 years and above 37 years of age as on 01-01-2016. Paper – 1 Semester – I & Semester – II of M.Com. (Prescribed by Punjabi University, Patiala). 100 Ques. 1.5 Mark. 150 Marks. 90 Mins. Paper – 2 Paper-II Semester – III & Semester – IV of M.Com. (Prescribed by Punjabi University, Patiala). 100 Ques. 1.5 Mark. 150 Marks. 90 Mins. 1. Balmiki/Mazbhi Sikh, Punjab 01. The Punjab Public Service Commission invites Online Application Forms from eligible candidates for recruitment to One Post of PPSC Recruitment 2016 Research Officer in the Department of Planning, Government of Punjab. PAY SCALE: Rs. 15600-39100 + 5400/- Grade Pay . (i) a) Master’s degree (with at least fifty per cent marks) in Economics or Mathematics or Agricultural Economics or Commerce with Statistics as one of the papers or Master’s degree (with at least fifty per cent marks) in Statistics from a recognized University For PPSC Recruitment 2016.
b) Should have nine month’s training in Statistics at any institute or office recognized by the Government or two years experience of dealing with economic and statistical matters in a Government office or in an interpretation which deals with collection, compilation interpretation and dissemination of statistical data on various socio-economic aspects of the economy, and is recognized by the State Government or the Government of India. (i) Candidates should not be below 18 years and above 37 years of age as on 01-01-2016. The Punjab Public Service Commission PPSC Recruitment 2016 invites Online Application Forms from eligible Candidates for recruitment to One Post of Legal Assistant in the Department of Labour Government of Punjab. 1. 1 Post of Legal Assistant 01.
ii) Should have practiced at the Bar for minimum period of two years or should have held an assignment involving legal work under the Government of India or a State Government or a public undertaking for a minimum period of two years. iii) Punjabi of Matriculation or its equivalent standard. (i) Candidates should not be below 18 years and above 37 years of age as on 1-1-2016. (iii) The Upper age limit is relaxed upto 42 years for Scheduled Castes and Backward Classes of Punjab.